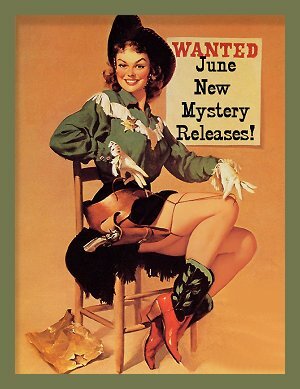 June 2017 New Mystery Releases! Publishers have definitely geared up for the summer because I had a difficult time narrowing my June picks down to the usual baker's dozen. Better too many choices than not enough, eh? This month's choices are a good blend of the new and promising, and of the familiar and favored. Something tells me that I should get right down to business, so I will. My picks for June are grouped together by their release dates, and I've included all the information you'll need to find them at your favorite book spots. Book synopses are courtesy of Amazon. Series: #1 in the Bodies of Evidence series paranormal mystery series. Synopsis: "Twenty-five-year-old Julie Hall has a unique ability: when she takes up a dowsing rod, she finds not water but bodies. To Julie, it's a curse, not a gift, and one she rarely uses—she prefers her quiet life in a trailer, with her grandfather and her dog for company. But when FBI agent Garrett Pierce shows up at her door seeking help with a case, she has no choice but to assist with their search. Three girls are still missing. The killer is still out there. 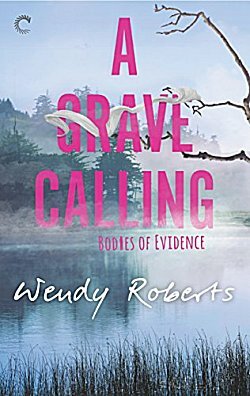 As bodies are discovered and more girls disappear, the case becomes almost more than Julie can bear. And when the killer turns his sights toward her, even her growing relationship with the protective Agent Garrett may not be enough to save her." 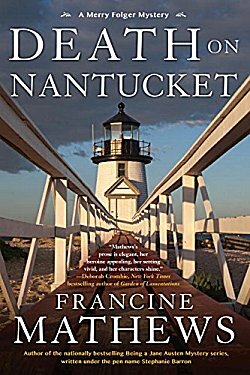 Series: #5 in the Merry Folger police procedural series set on Nantucket Island, Massachusetts. Synopsis: "Spencer Murphy is a national treasure. A famous Vietnam War correspondent who escaped captivity in Southeast Asia, he made a fortune off of his books and television appearances. But Spence is growing forgetful with age; he’s started to wander and even fails to come home one night. When a body is discovered at Step Above, the sprawling Murphy house near Steps Beach, Nantucket police detective Meredith Folger is called in to investigate. The timing couldn’t be worse: It’s the Fourth of July, and tourists are arriving in droves to celebrate on Nantucket’s beaches, so the police force is spread thin. On top of that Merry is planning her wedding to cranberry farmer Peter Mason, and her new boss, an ex-Chicago police chief with an aggressive management strategy, seems to be trying to force her to quit. Merry can’t conclude the Murphy investigation quickly enough for him. As she grapples with a family of unreliable storytellers—some incapable of recalling the past, and others determined that it never be known—she suspects that the truth may be forever out of reach, trapped in the failing brain of a man whose whole life may be a lie." Series: #17 in the Aimée Leduc private investigator series set in Paris, France. 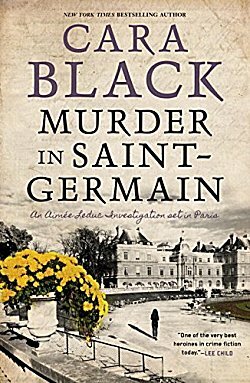 Synopsis: "Paris, July 1999: Private investigator Aimée Leduc is walking through Saint-Germain when she is accosted by Suzanne Lesage, a Brigade Criminelle agent on an elite counterterrorism squad. Suzanne has just returned from the former Yugoslavia, where she was hunting down dangerous war criminals for the Hague. Back in Paris, Suzanne is convinced she’s being stalked by a ghost—a Serbian warlord her team took down. She’s suffering from PTSD and her boss thinks she’s imagining things. She begs Aimée to investigate—is it possible Mirko Vladić could be alive and in Paris with a blood vendetta? Aimée is already working on a huge case; plus, she’s got an eight-month-old baby to take care of. But she can’t say no to Suzanne, whom she owes a big favor. Aimée chases the few leads she has, and all evidence confirms Mirko Vladić is dead. It seems that Suzanne is in fact paranoid, perhaps losing her mind—until Suzanne’s team begins to die in a series of strange, tragic accidents. Are these just coincidences? Or are things not what they seem?" Synopsis: "When editor Susan Ryeland is given the manuscript of Alan Conway’s latest novel, she has no reason to think it will be much different from any of his others. 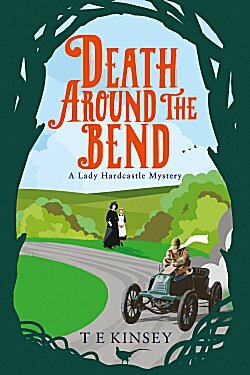 After working with the bestselling crime writer for years, she’s intimately familiar with his detective, Atticus Pünd, who solves mysteries disturbing sleepy English villages. An homage to queens of classic British crime such as Agatha Christie and Dorothy Sayers, Alan’s traditional formula has proved hugely successful. So successful that Susan must continue to put up with his troubling behavior if she wants to keep her job. 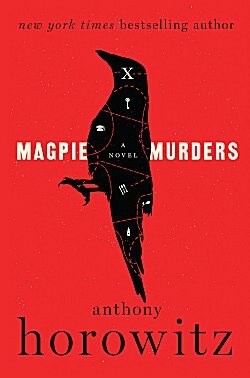 Masterful, clever, and relentlessly suspenseful, Magpie Murders is a deviously dark take on vintage English crime fiction in which the reader becomes the detective." Series: #3 in the Lady Hardcastle historical cozy series set in England. As the pair begin to make enquiries of Lord Riddlethorpe’s servants and guests, it seems that, below stairs and above, there is more to this case than meets the eye. And, even in the quiet of the countryside, death is always just around the bend." Series: #1 in the Agnes & Effie cozy series set in the Finger Lakes area of New York state. Synopsis: "When 28-year-old Agnes Blythe, the contented bifocals-wearing half of an academic power couple, is jilted by her professor boyfriend for the town Pilates instructor, her future is suddenly less than certain. So when her glamorous, eccentric Great Aunt Effie arrives in town and offers a job helping to salvage the condemned Stagecoach Inn, what does Agnes have to lose? But work at the inn has barely begun when the unlikely duo find the body of manipulative Kathleen Todd, with whom Agnes and Effie both have recently had words. Words strong enough to land them at the top of the suspect list. The pair has clearly been framed, but no one else seems interested in finding the real murderer and Agnes and Effie's sleuthing expertise is not exactly slick. Nevertheless, they're soon investigating a suspect list with laundry dirtier than a middle school soccer team's and navigating threats, car chases, shotgun blasts, and awkward strolls down memory lane. 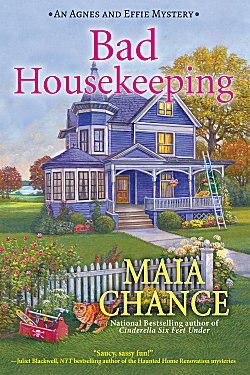 In Bad Housekeeping, the first novel in the Agnes & Effie cozy mystery series by Maia Chance, danger mounts, deadlines loom, ancient knob-and-tube wiring is explored, and the ladies learn a thing or two about the awful, wonderful mistake that is going back home." Debut mystery set in a bookstore. Synopsis: "When a bookshop patron commits suicide, his favorite store clerk must unravel the puzzle he left behind in this fiendishly clever debut novel from an award-winning short story writer. As Lydia untangles the mystery of Joey’s suicide, she unearths a long-buried memory from her own violent childhood. Details from that one bloody night begin to circle back. Her distant father returns to the fold, along with an obsessive local cop, and the Hammerman, a murderer who came into Lydia’s life long ago and, as she soon discovers, never completely left. 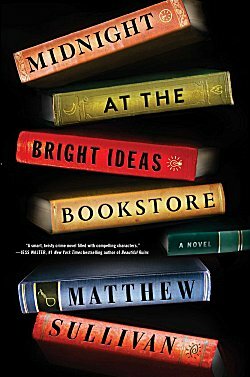 Bedazzling, addictive, and wildly clever, Midnight at the Bright Ideas Bookstore is a heart-pounding mystery that perfectly captures the intellect and eccentricity of the bookstore milieu and will keep you guessing until the very last page." Series: #8 in the Mike Bowditch game warden series set in Maine. 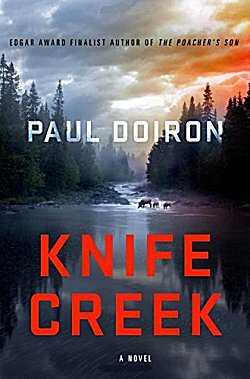 Synopsis: "When Maine game warden Mike Bowditch is tasked with shooting invasive feral hogs that are tearing up the forest in his district, he makes a horrific discovery ― a dead baby buried in a shallow grave. Even more disturbing: evidence suggests the infant was the child of a young woman who was presumed to have died four years earlier after she disappeared from a group rafting trip. As Bowditch assists the reopened investigation, he begins to suspect that some of his neighbors aren’t who they seem to be. When violence strikes close to home, he realizes that his unknown enemies will stop at nothing to keep their terrible secrets. Mike Bowditch has bucked the odds his whole career, but this time the intrepid warden may have finally followed his hunches one step too far." 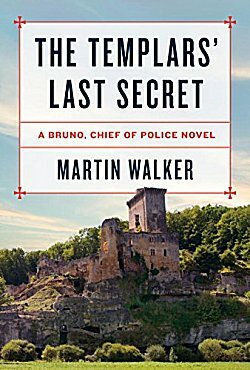 Synopsis: "When a woman's body is found at the foot of a cliff near St. Denis, Bruno suspects a connection to the great ruin that stands on the cliff above: the Château de Commarque, a long-ago Knights Templar stronghold which, along with the labyrinth of prehistoric caves beneath it, continues to draw the interest of scholars. With the help of Amélie, a young newcomer to the Dordogne, Bruno learns that the dead woman was an archaeologist searching for a religious artifact of incredible importance, the discovery of which could have dramatic repercussions throughout the Middle East--not to mention in St. Denis. And the woman's ties to Islamic terrorists can only heighten the pressure on Bruno to unravel the centuries-old mystery. Meanwhile, an old flame of Bruno's is assigned to work with him on the case, and the two find time, naturellement, to enjoy the supreme pleasures of the wine, food, and beauty of the Dordogne." Synopsis: "In this riveting new novel by the New York Times bestselling author of the Chet and Bernie mystery series, a deeply damaged female soldier home from the war in Afghanistan becomes obsessed with finding a missing girl, gains an unlikely ally in a stray dog, and encounters new perils beyond the combat zone. Shattered by one last blow—the sudden death of her hospital roommate, Marci—LeAnne finds herself on a fateful drive across the country, reflecting on her past and seeing no future. Her native land is now unfamiliar, recast in shadow by her one good eye, her damaged psyche, and her weakened body. Arriving in the rain-soaked small town in Washington state that Marci had called home, she makes a troubling discovery: Marci’s eight-year-old daughter has vanished. When a stray dog—a powerful, dark, unreadable creature, no one’s idea of a pet—seems to adopt LeAnne, a surprising connection is formed and something shifts inside her. 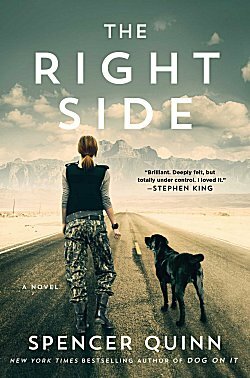 As she becomes obsessed with finding Marci’s daughter, LeAnne and her inscrutable canine companion are drawn into danger as dark and menacing as her last Afghan mission. This time she has a strange but loyal fellow traveler protecting her blind side." Synopsis: "As an old house is demolished in a gentrifying section of London, a workman discovers a tiny skeleton, buried for years. For journalist Kate Waters, it’s a story that deserves attention. She cobbles together a piece for her newspaper, but at a loss for answers, she can only pose a question: Who is the Building Site Baby? But there is more to the story, and Kate is drawn—house by house—into the pasts of the people who once lived in this neighborhood that has given up its greatest mystery. And she soon finds herself the keeper of unexpected secrets that erupt in the lives of three women—and torn between what she can and cannot tell…"
Series: #7 in the Haunted Home Renovation cozy series set in California. Synopsis: "When her friend Alicia hires Turner Construction to renovate a historic lighthouse in the San Francisco Bay, Mel Turner can’t wait to get her hands dirty. Alicia plans to transform the island property into a welcoming inn, and while Mel has never attempted a project so ambitious—or so tall—before, she’s definitely up for the challenge. But trouble soon arises when Alicia’s abusive ex-husband shows up to threaten both her and Mel, and later turns up dead at the base of the lighthouse stairs. With no other suspects in sight, things start looking choppy for Alicia. 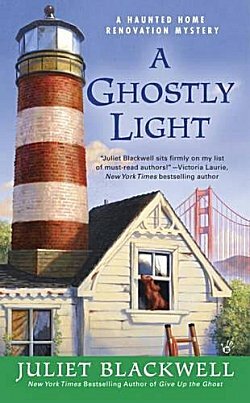 Now, if Mel wants to clear her friend’s name, she’ll need the help of the lighthouse’s resident ghosts to shine a light on the real culprit..."
Synopsis: "Sophie 'Phee' Kimball is not a cop. She’s a divorced, middle-aged mom who works as an account clerk for the police department in a small city in Minnesota. 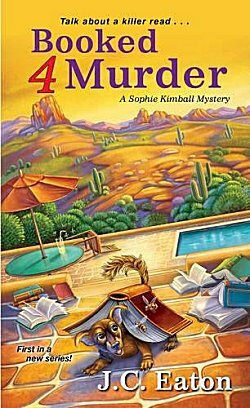 But her retired mother, Harriet Plunkett, is convinced Phee is the only one who can solve the mystery of a cursed book. According to Harriet, four members of her book club have already succumbed to the deadly curse. Harriet insists Phee catch the next plane to her retirement community in Sun City West, Arizona, to investigate. Is her mother just bored and lonely? She does have a new pet—a long-haired chiweenie (half Chihuahua, half Dachshund)—for company and a host of pals (although that number is admittedly dwindling). Phee is certain that their book club selection isn’t cursed, but is somebody really knocking off the ladies? As Phee starts to uncover dark secrets hidden in plain sight under the blazing Arizona sun, she’ll need to read between the lines before it’s someone else’s final chapter...."
Good lineup for June, isn't it? Which titles caught your eye and were included on your wish lists? Inquiring minds need to know! Thanks. Looks like several good books. What I notice first at the covers, and, as usual, there are a lot of good ones. 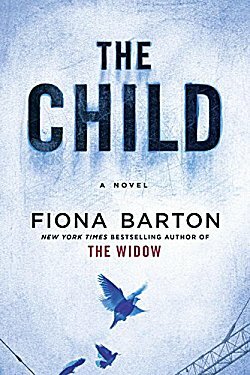 I can't read the Fiona Barton book; The Widow bothered me for weeks, so I'm avoiding that one. I've just started reading The Child now. Looking forward to several of these - I'm interested in the new Spencer Quinn book. Our mystery group really enjoy his Chet and Bernie books. And I want to read THE CHILD. I've had THE WIDOW for quite a while, but haven't picked it up yet. The Right Side is quite a departure from Quinn's Chet and Bernie books, and I really enjoyed it. I've just started The Child and am already getting pulled into the story. If you're like me and put it in "a safe place," you'll never find it! Fabulous list! thanks for the update. I have on order the Juliet Blackwell in kindle form and have on hold The Magpie Murder at the library when it is released in the U.S. Two of the books I need to read the first book in the series first. The first books in my TBR are by Doiron and Kinsey. I loved that first Kinsey book. I need to read the second one soon. I agree with others' suggestions. I'll wait to read what you write about "The Child." I was pulled into "The Widow," but it is a disturbing book from many points of view including denial by a spouse and what women will put up with. However, I am in agreement about the credit card. I just broke my New Year's resolution (one of them) and bought a book online. So now I'll have to give a neighbor my card to hide from me as I could easily order three books here.